Most of our Social Justice posts see a high percentage of social rage and/or debate play out on Facebook; the back and forth over Johnny Depp’s portrayal of Tonto was much more of a Twitter and Blog discussion. If you haven’t bumped into any of the controversy it’s because, as far as Social Media Rage goes, this one is about a 5 on the justice meter when it comes to outrage. The second uprising in Egypt has been the focus and concern of much of the Traditional press, and unlike the Paula Deen controversy, it appears that Americans shrug off the outcry of the Native American community with less angst than they do the use of racial slurs aimed at African Americans. 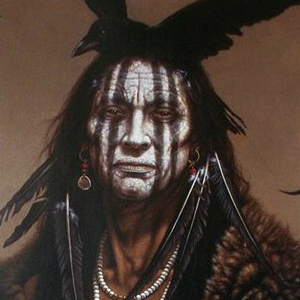 The display of face paint design crow feathers and crow headdress in the painting “I AM CROW” is an illustrative interpretation of the inseparable relationship between the Native American and their spiritual and natural world. I purposely do not denote a specific tribal affiliation to my paintings, allowing the personal sensibilities and knowledge of the viewer to create their own stories. Not surprisingly, Sattler is thrilled with Depp’s portrayal of Tonto; his print is now selling like hotcakes on his website. Johnny Depp himself was not totally oblivious to the potential for backlash as he, a white actor, played a larger than life Tonto. In his interviews for both Rolling Stone and Entertainment Weekly, he talks about his childhood awareness that something is wrong when he watched the white actor, John Todd, play a monosyllabic sidekick to the Lone Ranger. Almost as soon as the look of the Depp created Tonto was out, he was having to explain his creation. Disney and Depp were obviously aware from the beginning that their new Tonto may cause a stir, and they’ve done a decent job of fending off the backlash. However, much of the outrage that does exist was generated from Depp’s own interviews. I’m sure his publicist was thrilled with that statement. One of the recent interviews that sparked the most commentary from those for and against the Depp’s Tonto was with Rolling Stone. In all of his interviews Johnny Depp tries to explain that he meant no offense to Native Americans, and not all have been offended; he was made an honorary Comanche during the filming of The Lone Ranger. JJDuncan wrote a stellar piece titled that perfectly How to Talk About the Problems with Johnny Depp’s Tonto Without Sounding Sanctimonious that hones in on the fact that there is something creepy and uncomfortable for many of us just seeing Depp’s Tonto. Many have called the character out for being just another weird version of Jack Sparrow. Keene was discussing the movie way before itcame out, writing Depp’s Tonto, I’m still not feeling honored back in April of 2012. She immediately questions why Depp would use a painting by a non-Native American as the basis for his character, when that painter readily admits that the work came purely from his imagination. She cringes at the stereotypes of Native Americans that she sees in both the painting and Depp’s come-to-life copy of it. Because Tonto happens to be Native American, he has to be “wise,” “tortured and hurt,” “angry and rageful,” and “very understanding and unique”? That’s like Hollywood Indian Stereotypes 101. Suffice it to say that many Native Americans are offended by the Depp recreation of Tonto. Is the Depp Tonto Portrayal a Non-Issue? Often when I write these Social Media Justice posts I get push back from friends and others who ask “Aren’t there bigger problems in the world?” The answer to that is obvious and always YES. However, the point of this series is to follow the impact of social media on issues of the day, both in marketing and real life. Sometimes that impact is profound, and sometimes it is negligible or non-existent. The reality is that Depp’s Tonto made some people cringe, it angered many Native Americans, but it did not develop into a full fledged social media backlash like we’ve seen in other instances. The initial ticket sales project that the film will earn just shy of $200 million domestically, which is far less than the projects for Disney’s Despicable Me 2. From what the critics are writing the lack of true blockbuster status has a lot to do with bad film making in general and nothing to do with the sensitivity around Depp’s Tonto. In the grand scheme of Hollywood firestorms, this story will most likely fade from coverage and be forgotten totally. What makes this a topic worthy of in depth discussion is that it centers on the difficult discussions of race in American culture. Although the controversy did not take on the viral coverage that the Paula Deen deposition did, Native Americans who are disappointed and angered by the film have a voice via social channels that was missing in the past. bschorr ArCIntel I have to admit, listening to him is really, really tough. @bschorr AmyMccTobin ArCIntel I meant in his INTERVIEWS. He loves the sound of his own voice. What is really sad to me is that it appears that we are still allowed to stereotype and generalize about Native Americans and no one really seems to care. I think the main thing with this example is the reaction due to Depp’s of-handedness when asked about his inspiration. That (for me) doesn’t help advance Native American (or any other culture) properly. Dunham has her own issues of perceived impropriety, however, her tweet DOES sum it up perfectly. I was just conversing with a friend about this, and what really confuses me is that Tonto didn’t have to BE Johnny Depp. And then again, it did. Because did we discuss that the role itself cannot be played with sensitivity by a non NA, and can’t be believable when played by a NA (because of the “Hollywood sellout” aspect that the actor in question would face). I do equate this role as Johnny Depp safely trying out black-face. Because in the end, this movie is another rehash of one of America’s most beloved movies, Breakfast at Tiffany’s where Mickey Rooney mocked & mimicked his version of an Asian man. And @AmyMccTobin, I think there AREN’T bigger problems to be calling out, personally. Because such a sprawling myriad of problems sprout from this root issue: people find other cultures, ethnicities and heritages LESS VALUABLE, and therefore undeserving of the RESPECT that is foundational for humane treatment and policies of all kinds. OneJillian I’m with you on the last paragraph most certainly Jillian – what seems clear to me is that gay bashing ala Alec Baldwin, and ridiculing Native Americans seem to still be ok. When I posted about the Baldwin comments on Facebook many of my gay friends thanked me, but privately. What is really clear to me is that our society needs to have a civil discussion about race. DannyBrown OneJillian ArCIntel Wow. Now that’s high praise. THANK YOU (with absolutely NO snark included). AmyMccTobin DannyBrown OneJillian wow Danny gave you a compliment Amy! There’s validation! DannyBrown hessiejones AmyMccTobin was that british for “shhhh” ??? Hollywood has played it pretty loose with historical facts over the years and with the depiction of different people and groups. It is probably worth noting that in the 1915 film, Birth of a Nation, the KKK were portrayed as heroes. Fast forward a few decades and that depiction shifts completely to villainy. In this era of social justice, maybe Hollywood will be more cautious in their depictions and try to avoid racism and caricature.